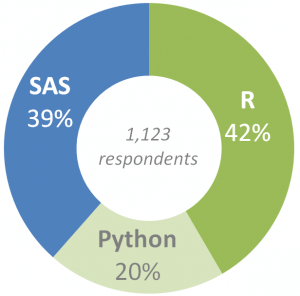 Python, R and SAS are the three most popular languages in data science. 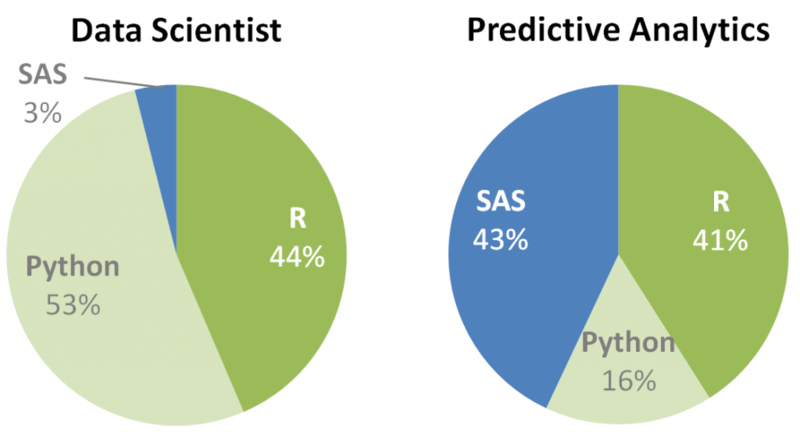 If you are new to the world of data science and aren’t experienced in either of these languages, it makes sense to be unsure of whether to learn R, SAS or Python. Don’t fret, by the time you’re done reading this article, you will know without a doubt which language is the right one for you. Python –Python is a multi-purpose, free and open source programming language which has become very popular in data science due to its active community and data mining libraries. SAS – SAS has been the undisputed market leader in the enterprise analytics space. It offers a huge array of statistical functions, has a good GUI for people to learn quickly and provides brilliant technical support. You don’t require prior knowledge in programming to learn SAS, and its easy-to-use GUI makes it the easiest to learn of all the three. The ability to parse SQL codes, combined with macros and other native packages make learning SAS child’s play for professionals with basic SQL knowledge. To analyze data in Python, you will use data mining libraries like Pandas, Numpy, and Scipy. In other words, you won’t code in native Python language when analyzing data. The code you write in these libraries looks somewhat similar to the code you write in R. Hence, it is easier to learn R when you are already familiar with the Python data mining libraries. If you already know R, then you should learn the basics of Python programming language before you start to learn the Python data mining ecosystem. So, don’t think that R is difficult, and Python is easy to learn! SAS is extremely efficient at sequential data access, and database access through SQL is well integrated. The drag-and-drop interface makes it easy for you to create better statistical models quickly. It has decent functional graphical capabilities, but it’s difficult to create complex graphical plots in SAS. I Python notebook – a web-based interactive environment – makes it easier to share your code with anther. SAS doesn’t have an active open source community at all. SAS has more than 80,000 customers around the globe, and most of them are corporate with huge budgets. Analysts in these organizations use SAS to quickly and efficiently execute a wide range of statistical models on data sets. That is why the tile “analyst” is often mentioned in SAS job descriptions. 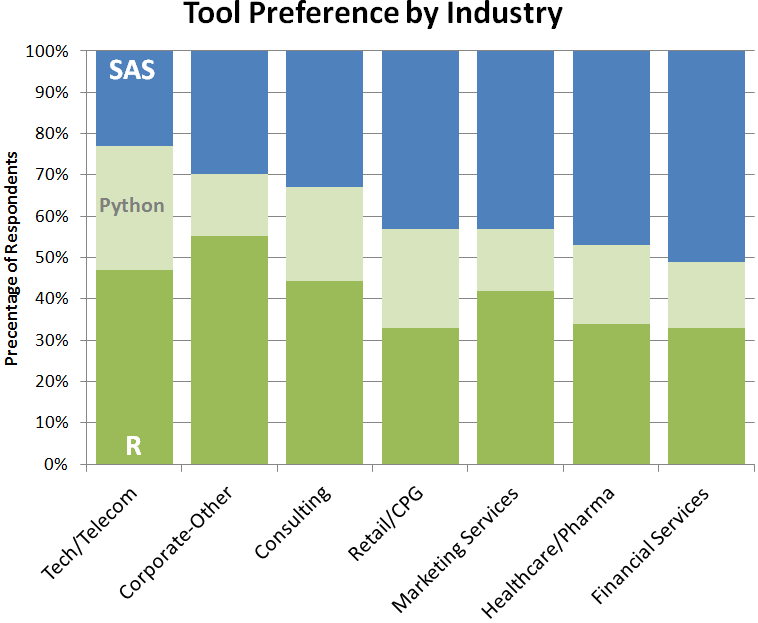 On the other hand, R and Python are used by startups and technology companies. R is more inclined towards tasks related to statistics and data analysis because of which R related jobs have mentions like “ Data miner”, “ Statistician”, “ Data analytics manager”, etc. 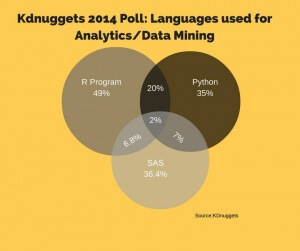 Meanwhile, given the boom in big data — you can expect increasing numbers of business analysts and other non-programmers to arm themselves with the R language as well. Whereas, Python is used by programmers that want to delve into data analysis or apply statistical techniques, and by developers that turn to data science. Python related jobs have mentions like “Machine learning engineer”, “ Data engineer”, “ Big data architect”, etc. Should you make a distinction between distinction between SAS GUI offerings? Are you talking about JMP or Enterprise Miner or the programming-based offerings. I have worked with all three--am a certified base programmer with two university level course work. In the case of E Minor all is drop, etc., but when things get serious one needs to know how to program in SAS. JMP, in contrast to E Minor and standard programmed, is meant for those lacking strength with coding and largely seems to compete for Minitab users. By using R initially, one will become strong in the concepts of statistics and you have to write the code step by step. If a code for a particular step is missed you wont get result. I recommend to start initially with R, and to learn other softwares also, which is definitely going to add value. I think that all have their own place in this world. One huge advantage to SAS is that in the industries where it is used extensively it is often on a grid(distributed computing) so it can deal with very large datasets pretty quickly, it also has lots of great features for data cleaning, and data management that R and Python just don't have. SAS as a company does lots of services that don't exist for the others like model management... The big problem with SAS is that even if you are familiar with SAS and have access to SAS it doesn't mean that you have the SAS that you need. There are so many modules and product offerings that if you want to do anything outside of base SAS you need a seperate module. Base SAS and SAS Stats are pretty common, but beyond that it is up in the air. Python and R are great, if I had my choice I would use SAS for data management and Python or R for the statistical analysis and maybe Tableau for visual analysis(super quick to get good visuals up and running and dynamic). I only have some experience with Python and R, and like both of them quite a bit. I love coding in R or Python in Jupyter Notebook because of the interactiveness. Python and R will always have an edge when it comes to newer algorithms because their open source communities are great. When I am hiring new employees for analytics I look for depth of analytical knowledge and skills with strengths in one of these languages and SQL. If you know one you can learn the others pretty easy, SAS is the most different. The hardest part to learn is just how to do the logic for the data cleaning and the theory to use do analytics appropriately. Also, many data scientists use multiple languages: I have used R, Perl, SAS, Shell scripts, even C, and SQL, for many years, usually simultaneously depending on the task. So Burtch Work's first chart (with 39% / 42% / 20%) should actually add up to well above 100%, even though it did not include "other" which encompasses all languages except R, Python and SAS. Very interesting article though, thank you for your post! I guess SQL is better for manipulation of super large data sets which may cause memory issues in either R or Python. Afterwards, for analysis purposes, i prefer to use R or Python. I started my data science adventure with R ,and with no previous experience in anything more than the "hello world" level knowledge of Java and C.
I took Python courses after finishing with several R courses and still I found it really tiring for me. This article exactly meant for the persons like me, who want to transition into the world of Analytics. I've already kick started R-programming by reading few articles and overview and curriclum. And this article has now instilled confidence in me.